Socialism: What's in a Name? 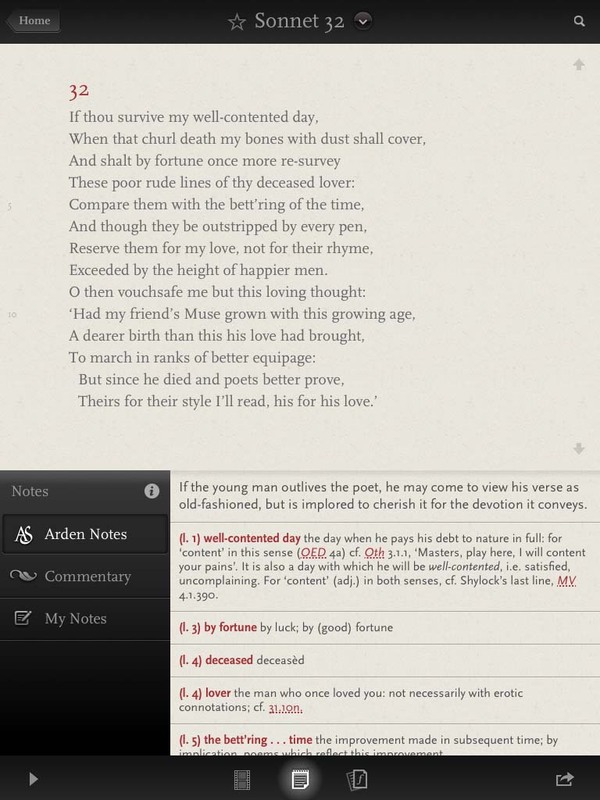 Hot off the heels of their outstanding 2011 iOS app T. S. Eliot's The Wasteland, Touch Press brings us the even more impressive app of Shakespeare's Sonnets. If you have used their Wasteland app then you you know this is no simple etext presentation of the sonnets but a rich program for studying and enjoying the poems. 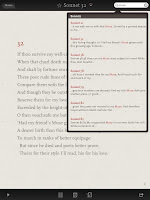 Shakespeare's Sonnets features all 154 sonnets plus A Lover's Complaint beautifully laid out in grey text over a deckled white background and very easy on the eyes. 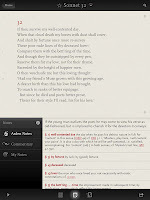 You can swipe up and down to bring up the next or previous sonnet or you can tap the sonnet number to bring up a menu which presents you with each sonnet's number and incipit. A bottom menu lets you easily switch with one tap to the corresponding 1) notes from the Arden edition, 2) commentary from Don Paterson, 3) place in the 1609 Quarto, or 4) blank space for your own notes. You can tap the text to see if there are any notes for a particular word or to listen to the passage. 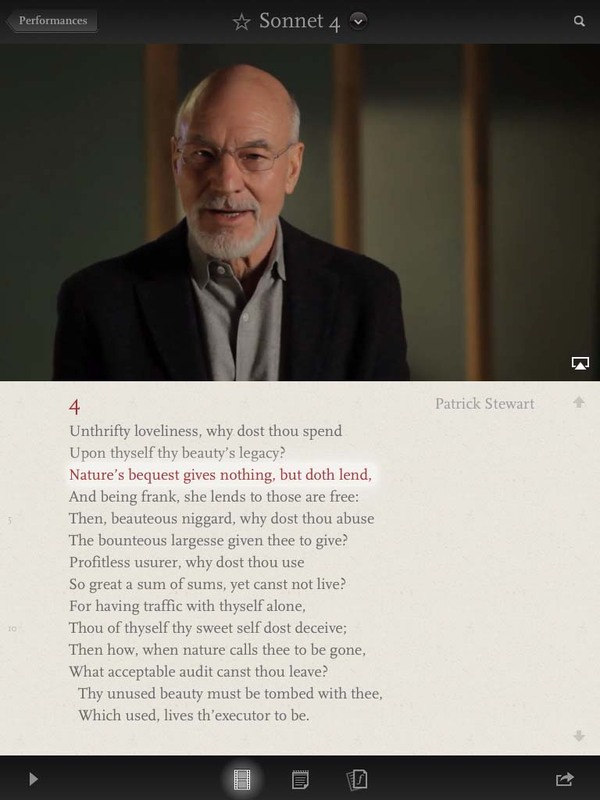 That's right, Shakespeare's Sonnets includes audio recordings of all 154 sonnets read by actors such as Patrick Stewart, Fiona Shaw, and Stephen Fry. Moreover, the audio performances are presented with optional video so you can choose to 1) listen to the audio as you view the text, 2) listen to the audio as you view the text and notes or commentary, or 3) view a split screen of the text and video. I have yet to sample all of the readings but they are so far excellent. The entire app supports AirPlay so you can stream the text, audio, and video to any Apple TV and thus to any TV or projector, a wonderful option for teachers. 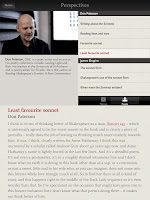 Those studying the poems will undoubtedly enjoy the searchable index and even more so, the hyperlinked notes. 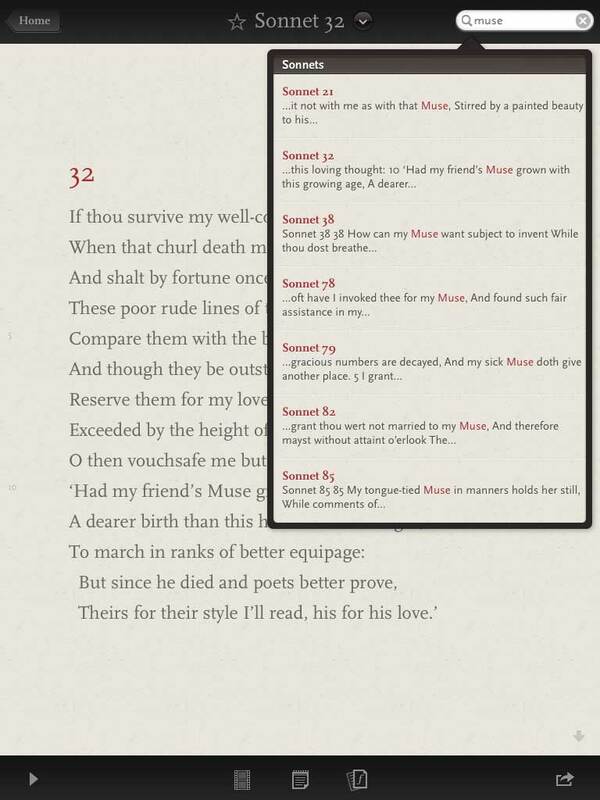 For example, if you are reading Sonnet 32 and encounter a reference to No. 78 in the notes, you can simply click the note and jump to No. 78. 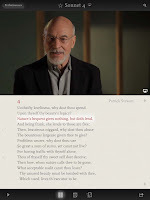 Lastly, Shakespeare's Sonnets includes a section of forty short discussions with a number of scholars including poet, writer, and musician Don Paterson, James Shapiro, Professor of English and Comparative Literature at Columbia University, and Henry Woudhuysen, Professor of Enslish at UCL. 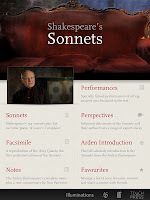 The discussions range from biographical details and Shakespeare's use of the sonnet form to recurring characters, and the order, language, and sound of the sonnets. The brief and lively videos serve as neat introductions to a variety of topics and could be useful points of departure for group discussions. Overall, this is an outstanding app rich in resources and brilliantly polished. It's also a veritable steal at $13.99. A scant price to pay for having this elegant presentation of Shakespeare's treasures at your fingertips.